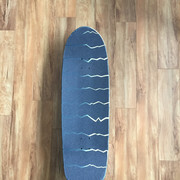 Carver c7 trucks on a custom shaped deck, will also include beat up original deck if you want. Just put brand new 70mm wheels and bones bearings on it. Makes a great cruiser to check the Surf or pump around. Shoot me a pm for my number and I’ll text pics.